PennsylvAsia: "Pearl Harbor tarnishes American dream". "Pearl Harbor tarnishes American dream". 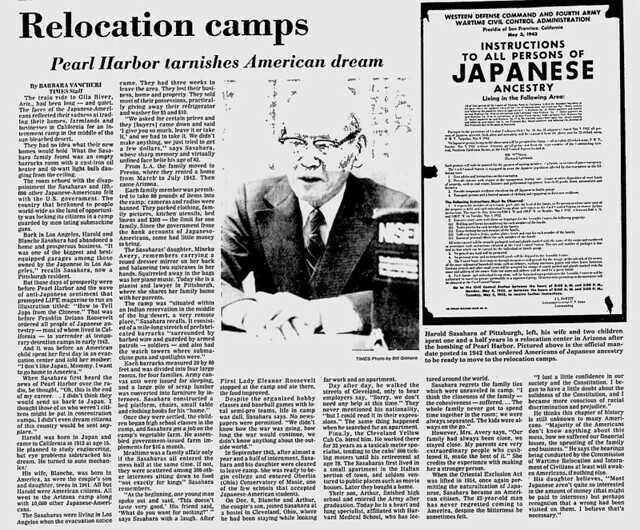 Thirty-two years ago the Beaver County Times marked the anniversary of the Pearl Harbor attack by talking with Squirrel Hill resident Harold Sasahara about his and his family's journey from California to Japanese internment camp to Ohio and eventually to Pittsburgh. Back in Los Angeles, Harold and Blance Sasahara had abandoned a home and a prosperous business. "It was one of the biggest and best-equipped garages among those owned by the Japanese in Los Angeles," recalls Sasahara, now a Pittsburgh resident. But those days of prosperity were before Pearl Harbor and the wave of anti-Japanese sentiment that prompted LIFE magazine to run an illustration titled: "How to Tell Japs from the Chinese." That wasb before Franklin Delano Roosevelt ordered all people of Japanese ancestry---most of whom lived in California---to surrender at temporary detention camps in early 1942." When the Oriental Exclusion Act was lifted in 1954, once again permitting the naturarlization of Japanese, Sasahara became an American citizen. The 82-year-old man has never regretted coming to America, despite the bitterness he sometimes felt. "I lost a little confidence in our society and the Constitution. I began to have a little doubt about the solidness of the Constitution, and I became more conscious of racial discrimination and prejudice." Worth a read, too, about his later life is his September 1, 1997 Pittsburgh Post-Gazette obituary. One of his great passions was Ikenobo, a Japanese school of flower arrangement derived from the ancient Buddhist religion. He founded many societies in Pittsburgh and Ohio and taught classes in his craft at Community College of Allegheny College [sic], the University of Pittsburgh informal program and the Pittsburgh Garden Center. But the highlight of his life, said his daughter, was receiving the Order of the Sacred Treasure from Emperor Hirohito himself. "It made up for a lot of the disappointments in his life," said daughter Mineko Avery. May I add a little to that story? Some years ago, while teaching American History at Carnegie Mellon University, I invited Mr. Sasahara to meet my class. There he answered questions and commented on his experiences in being taken from his California home and business to an internment camp early in World War II. He offered a sharp but carefully defined criticism of that deep injustice. But he followed it with an appreciation of the openness of an American society which could then let him alone to do his best in doing what he did so well. He could forgive, if not forget. Many of my students at that time came from homes where they had heard of Japanese as recent enemies. While Harold Sasahara as articulate good citizen impressed them, they were even more struck by his humanity, dignity and good humor. We will all miss him. Conflict Kitchen in the Korea Times. Christmas cakes at Paris Baguette. Pirates lose Taiwanese pitcher in Rule 5 draft. Build yourself a Himeji Castle. Yayoi Kusama is still here. Fukuda's Toro Fest 2013, December 10 - 16.